Her second, The Cutting Season, deals with the murder of Inés Avalo, an illegal immigrant from El Salvador, who has been cutting sugar cane in the fields that once belonged to the Louisana plantation known as Belle Vie. The cane fields are now owned by an industrial farming conglomerate, but the ravishing house and gardens have been kept by the Clancy family, to be hired out for weddings, educational events and other functions. Caren Gray, who grew up on the plantation, manages the business and lives on site with her nine-year-old daughter, Morgan. As the narrative develops and the killing of Inés links to a much older murder, Morgan’s father takes time off from his law practice in Washington DC, and his fiancée, to help Caren protect their daughter. His return sparks old memories in Caren, and together they work to beat the corrupt local law officers and find the truth about both deaths. In Locke’s hands this would have provided a good crime novel on its own, but she has woven through it an engrossing exploration of freedom in all its trickiest aspects. In the background is, of course, the whole issue of slavery, its abolition, and the difficulties faced by the liberated slaves after the civil war, but Locke is too sophisticated a writer to leave the subject at that. Freedom’s ambiguities and complications are there in every aspect of Caren’s relationships, and she is well acquainted with the loss it can bring. Her loving, protective, but increasingly irritated dealings with nine-year-old Morgan sum up all her difficulties: she can allow the child complete freedom only when she is safely within the locked gates of Belle Vie, the plantation where their ancestors were once slaves. 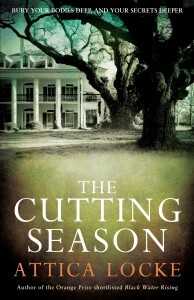 The Cutting Season is an involving and moving novel, which shows why so many thoughtful writers choose crime fiction through which to explore their ideas.